Travel the ancient China Seas with famed explorer Zheng He as he traverses the oceans in search of a fortune in 1421 Voyages of Zheng He slot from IGT. This game is a hit in land based casinos worldwide and now you can play this 88-line slot online! Choose your own level of volatility in the bonus with selectable free spins multipliers and a winner-takes-all cup game. 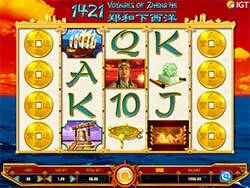 Filled with lucky numbers and rich animations galore, 1421 The Voyages of Zheng He is sure to be a game you add to your regular slots play list! You will have plenty of opportunities to conquer the exotic East as you Sail across oceans near and far. The backdrop for this game is gorgeous with rocking waves and a fiery red sky. The symbols include Zheng He of course, and a variety of other symbols to help you on your quest. Win extra prizes when you hit lucky coin wilds, free spins or the rewarding Cup Feature! Lucky Coin Wilds – The Lucky Coin symbol is wild and substitutes for all symbols except the bonus symbol. Scatter Symbol – Land three bonus symbols scattered anywhere on reels 2, 3 and 4 to win 2x your total bet and be awarded the Player Decision feature! Player Decision – If three bonus symbols appear on the middle three reels in any position you will win the Player Decision feature. Choose whether to play 20 free spins with small random multipliers, 15 free spins with medium multipliers or 10 free spins with large multipliers. Cup Feature – A Golden Ball is hidden under one of three cups. After the cups are shuffled you get to select one cup. If the golden ball appears under the selected cup, a win of 79 times the triggering total bet is paid!